Whether it’s a cough, a cold, the flu or allergies – when your kids are sick – all you want to do is help them feel better, fast. These 13 sick kid hacks will help you do just that. From prevention to learning the basics to genius ideas and even how to find comfort, your kids will be feeling better fast with these sick kid hacks. Sometimes preparation in everything in keeping your family healthy. Teaching your child how to blow their nose is something that will help you all feel better fast. No more chasing runny noses for you, and the ability to clear out all that mucus for your kids. Follow these simple tips to teach your child to blow their nose. Hoping to avoid illness in the first place? It’s not easy, but it can be done! Follow these great tips from Kid Stuff World, and your family will be on their way to staying healthy. Need more ideas on how to keep your family healthy? From hand-washing to dietary changes, and even an important lesson to teach your kids, these tips are a must-read! Kids Activities Blog walks you through 10 cough and cold tips for moms – including using a humidifier. #5 is especially important! But they don’t stop there. Read these additional five cough and cold tips from Kids Activities Blog to help even more – including eating more Vitamin C and getting a whole lot more rest. Looking for a more detailed guide? From how to treat a fever to when to give honey and what really soothes runny noses, your entire family will benefit from these cough and cold remedies. When your baby has his or her first cold, it can be downright painful to see them not feeling well. Anna at My Life and Kids shares her top tips to help your baby feel better FAST. Meraki Lane shares some great ideas for helping your family survive cold and flu season. We love why she recommends breaking the rules – and we certainly learned something new with her warm jello trick! Read all about it here. From the right way to disinfect your house to how to wash your bedding to make sure that the germs are gone (and what to do about those toothbrushes), Your Modern Family shares some great cold and flu hacks right here. Once you’ve googled cough remedies and scoured Pinterest for cold remedies, follow these 5 tips to help your sick kids feel better. When your kids are feeling miserable, these comfort tips for sick kids are sure to help. If you or your kids aren’t feeling well, this simple chicken soup recipe might be just what the doctor ordered. With onions, celery, carrots, chicken and egg noodles, this chicken soup recipe is loaded with the vitamins and minerals your body needs when you’re feeling under the weather. Kids have snotty noses? Your solution to snotty is right here! Looking for More Comfort This Season? If your kids are feeling under the weather, be sure to have plenty of Boogie Wipes® saline nose wipes around to catch coughs and sneezes. 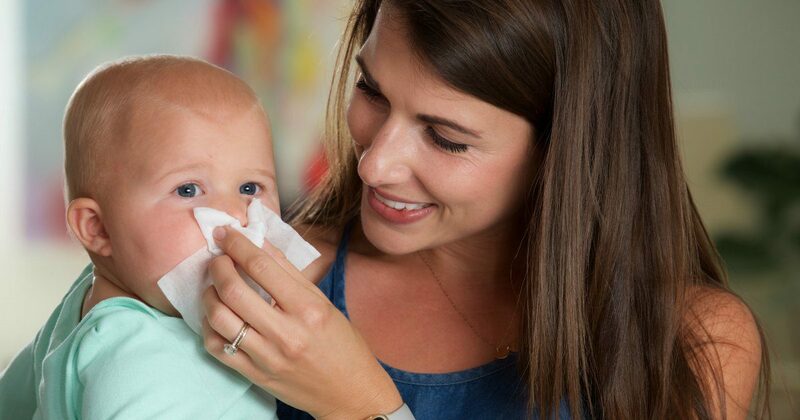 Unlike other wipes, Boogie Wipes® saline nose wipes have no harsh or drying chemicals. The natural saline dissolves mucus without irritation – thanks to Vitamin E, Aloe and Chamomile. Even better? Boogie Wipes® saline nose wipes contain no alcohol, no chlorine, no parabens and no phthalates. Click here to learn more about the power of natural saline.